Thanks to Beverly Johnson deanjohnson@torchlake.com for sending this story about the William Russell family. The typing errors, however, are mine. Thomas Russell and Mary Monk Russell and seven children lived in Shoreham Parish of County Kent, England. His sixth child William Russell was the only son to come to Canada, then to the United States. A grandson, James came later. William Russell, Sr. married Hannah Ann Letchford in England, they had nine children. In the spring of 1857 they decided to come with their nine children to Canada, near Brockville, Ontario, on the St. Lawrence River. The trip for the family would have many hardships; the difficult voyage would last six weeks, they had a newborn, born December 1856; but, the hardest difficulty to bear was the lost of their eight year old son, James, due to an epidemic on ship. He was buried at sea. 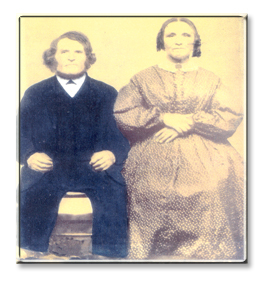 William and Hannah Russell had a farm in Canada from 1857 to 1864 when they decided as a family to move to Elk Rapids. By this time some of their children had married; but, with their extended families they started out by boat, along with their farm animals. This journey too would be long; first via Lake Erie, up Lake Huron, then into Lake Michigan to the port of Elk Rapids. In 1864 Elk Rapids was a city but the port had no docks. The animals were pushed off the boat into the water and left to swim to shore. People arriving in 1864 in Antrim County could well be described as the very early pioneers of the region; the Russell family would be included in that list. When they first arrived, they were sharecroppers south of Elk Rapids. Then, in 1869 William, Sr. took advantage of the 1862 Homestead Act and acquired his homestead of 160 acres in Milton Township. William Sr.'s sons Charles and John were too young to apply so the Homestead reads William Sr. and as they became older, the property was divided between Charles and John. Henry and William, Jr., now married, also applied and each received their own homestead properties of 144 and 147 acres respectively. Thomas purchased property also. The Russell's land, if not side by side, was all in the same area. William Russell Sr.'s 160 acre homestead was in what we know today as Torch Lake Township; but, in 1869 that area was Milton Township. The homestead was sold in 1967, just two years shy of having been in the Russell family for 100 years. The first and second generations of William Russell held the flame a long time; but, like so many families of that time, as the older members retired, the younger members left the farm for the city for better jobs. Years ago the family Bible was where all record of births, marriages and deaths were kept. Lucky is the family that has the family Bible present. In 1932 Mrs. John Russell was interviewed and it was reported that the family Bible was lost in a homestead fire. The Russell Cemetery records were lost. A list of 15 names is on record* of unmarked graves, given to Mrs. John Russell that day. *In 1933, two Daughters of the American Revolution (DAR) ladies from Kalamazoo came to Antrim County to do some genealogy research. Their research efforts, including this interview, were typed and bound in book form. Copies may be found in the Burton Collection of the Detroit Main Library and in the Library of the State of Michigan in Lansing -- Ed. note.